CRISPR Therapeutics might lead its start-up peers, but its collaboration partner is the better stock to buy. Gene-editing pioneer CRISPR Therapeutics AG (NASDAQ:CRSP) has sparked imaginations and puffed up portfolios. Before you dive in, though, you might want to take a look at its much larger partner, Vertex Pharmaceuticals Incorporated (NASDAQ:VRTX). CRISPR Therapeutics recently became the first among its U.S.-traded peers to initiate a clinical trial. That's a big deal, but its stock looks like a big gamble that probably isn't worth the risk. No matter how you feel about the future of gene editing, you really should understand why Vertex is the better biotech stock to buy right now. All cystic fibrosis (CF) patients have difficulty breathing caused by sticky mucus that's hard to clear from their lungs, but there are at least 1,700 known genetic mutations that cause the problem. Right now, Vertex Pharmaceuticals markets the only three treatments that address the root cause of this life-shortening disease. Without any other options, demand for new CF treatments is so strong that Symdeko hit an annualized run rate of $744 million during the three months ended June despite launching just four months earlier. Total second-quarter revenue jumped 46% compared to the prior-year period, to an annualized $3.0 billion. Vertex's CF operation still has a lot of room to grow. Across North America, Europe, and Australia, the disease affects around 75,000 people, but Vertex's products are only approved to treat roughly half of them at the moment. Vertex thinks it has experimental treatments in late-stage development that will expand its reach to perhaps 68,000 patients within a few years. In March, the company began a pivotal study with VX-659, and we should know if it hits a four-week primary efficacy endpoint before the end of the year. Another pivotal study involving VX-561 should have primary efficacy data ready around the same time. Adding it to Symdeko led to an 11% lung function improvement in a mid-stage study, and similar results in the larger trial would give it blockbuster potential. Vertex isn't wasting time and plans to file applications for both candidates by the middle of 2019. Trying to develop cutting-edge medicines as quickly as possible isn't cheap, and Vertex is on pace to spend around $1.3 billion on research and development alone this year. Despite making such heavy investments, operations are becoming highly profitable. 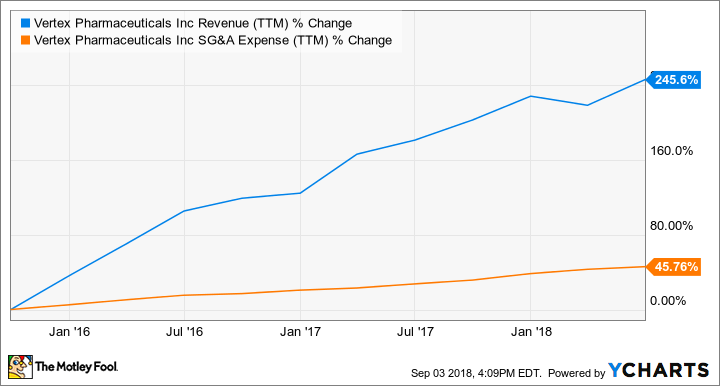 That's because a lack of competing CF drugs has allowed product revenue to accelerate past spending on sales, general, and administration (SG&A) expenses over the past few years. VRTX Revenue (TTM) data by YCharts. Vertex has started using the profits its drugs generate to expand its pipeline, and that includes a partnership with CRISPR Therapeutics. In 2015, Vertex handed CRISPR $75 million up front for the right to choose up to six new drug candidates. The first, CTX001, is aimed at two rare blood disorders and a clinical trial at a single site in Germany has already begun. Currently, CRISPR Therapeutics is a $2.7 billion company that has yet to give one of its drug candidates to a human. If CTX001 flops, as most experimental treatments do, CRISPR Therapeutics stock will tank. Vertex shareholders might feel a slight pinch if CTX001 flops, mainly because it would let the air out of an equity stake Vertex has in CRISPR that's ballooned since 2015. More than anything, though, Vertex needs to worry about another viable competitor entering the CF arena. Luckily for Vertex, the threats don't appear too severe at the moment. A partnership between Galapagos NV (NASDAQ:GLPG) and AbbVie Inc. (NYSE:ABBV) is arguably furthest ahead, but the smaller biotech also began reviewing the future of its collaboration after releasing less than thrilling mid-stage results for a partnered candidate earlier this year. Positive cash flows that are growing rapidly today, always beat potential sales for an unproven class of drugs years from a Food and Drug Administration submission. That said, investors have awfully high expectations for Vertex. A market giddy for biotech has driven Vertex's stock price up to 18 times trailing sales at recent prices, while most commercial-stage biotechs trade in the mid-single-digit range. If a competitive entrant forces Vertex to lower prices over the next few years, the stock's valuation will start to resemble its peers and leave investors sitting on heavy losses. Without any major threats on the horizon, though, Vertex has a better-than-average chance to outperform for investors who buy now and hang on for the long haul.